Vision - Scale Africa Inc.
On a tour of the Chiutika Basic School in 2006, while visiting Mfuwe, Zambia, Guy and I were immediately struck by the crumbling conditions of the only classroom building and the unlikely enthusiasm of the students learning there. At the end of our visit, Mr. Lungu looked to me earnestly and said “what we really need is a library.” As an architect, my head was swimming, “how can I build this place a library, what would it take?” He continued, “…well, what we really need is a dictionary.” One dictionary for his 1000 students. Even though we had just met, we couldn’t walk away from these kids when we felt we had the capacity to help them, especially when presented with this very humble request. We weren’t sure in what form yet, but we were determined to do something. Back home in Brooklyn we started sending books. First a dictionary and a thesaurus, but also books on Zambia’s culture, history and wildlife. We were also exchanging letters with Mr. Lungu, getting the news on the kids and the happenings in the community. One letter came, telling us the roof had blown off the classroom building at Chiutika. We decided we would step up and help build better classrooms- we felt such a connection to them at this point, we couldn’t let them down. 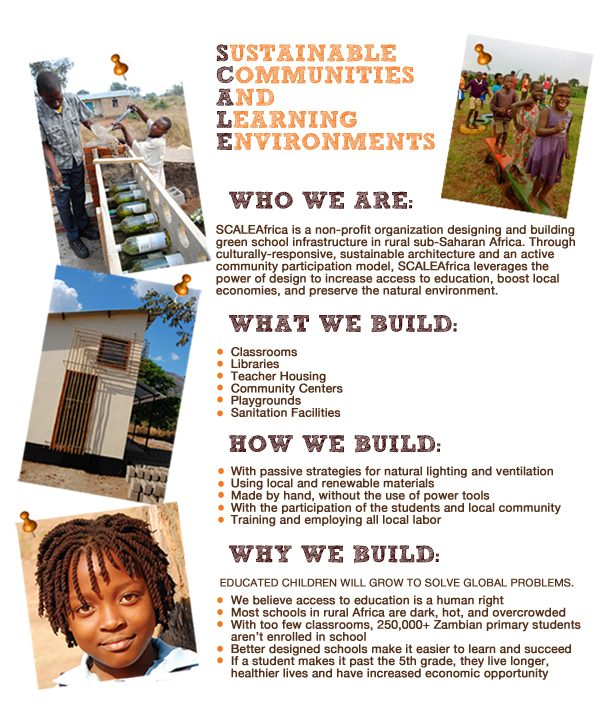 We founded SCALEAfrica with this one little project. SCALE may be an acronym for Sustainable Communities and Learning Environments, but it also implies a model for growth - something that may start small, but has larger goals in its future. By small we mean a tiny catalyst, like a dictionary. By larger, we mean expanding our reach so that any child who wants to go to school will have that chance.